Glorious Forever (left) completes a clean sweep of all four G1s for Hong Kong with a win in the LONGINES Hong Kong Cup. 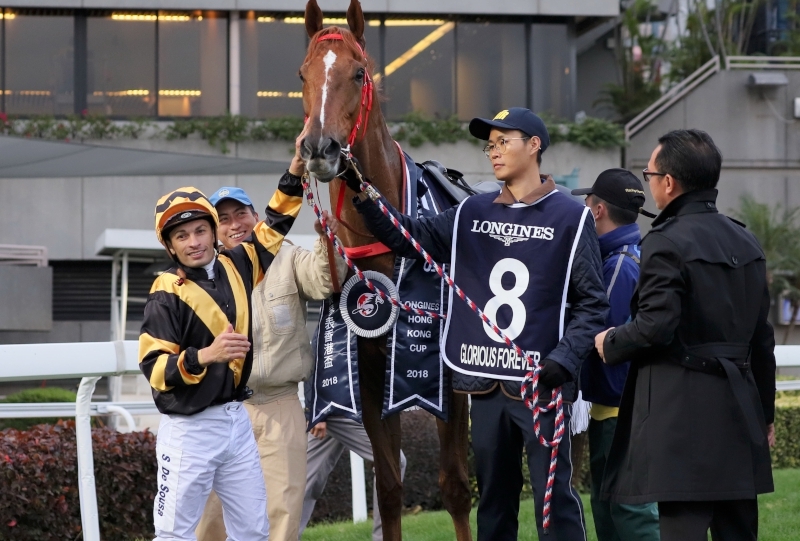 Hong Kong’s Frankie Lor, in just his second season of training, today may well have announced himself as a likely future champion of his home town when Glorious Forever claimed the flagship HK$28 million G1 LONGINES Hong Kong Cup (2000m). 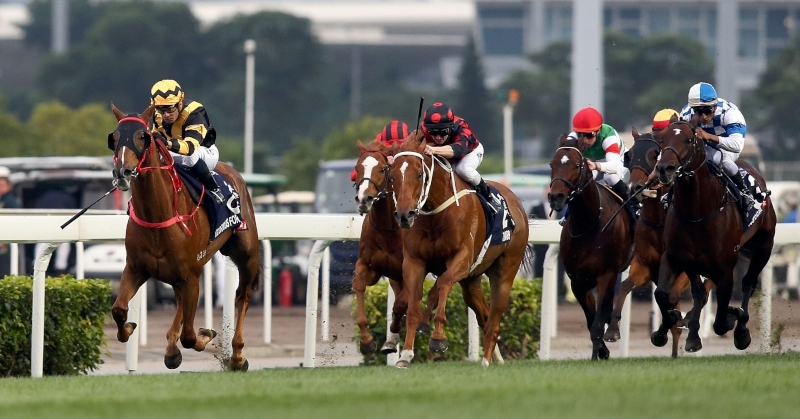 The win, of course, followed Lor’s earlier success with Mr Stunning in the Hong Kong Sprint and this momentous double may point to an imminent changing of the guard on a day when all four feature races fell - for the first time - to Hong Kong trainers. Retirement could loom at the end of next season for John Moore, who won the Hong Kong Mile while Tony Cruz, who had the Hong Kong Vase winner, is nearer to the end than start of his career. 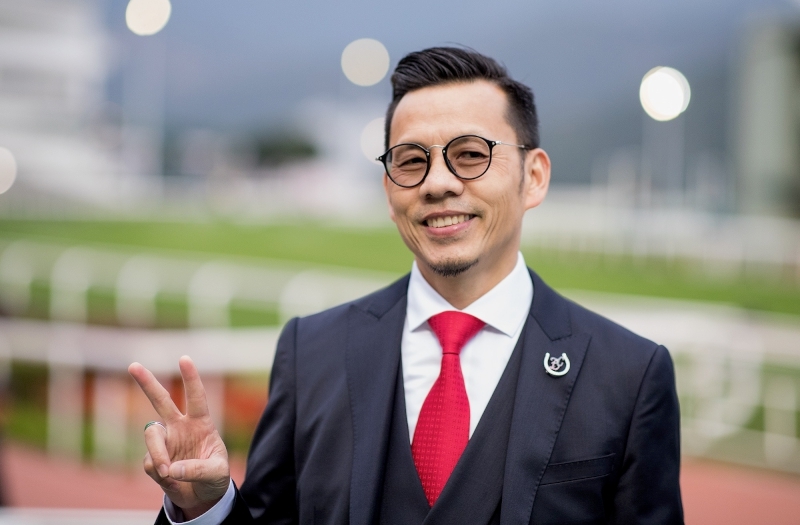 In just 18 months, indeed in less than two hours this afternoon, Lor managed to train as many Hong Kong International Races winners as his mentor John Size and only Cruz, Moore and Ricky Yiu have more among Hong Kong-based trainers (at the time of the wins). Glorious Forever, ridden by Silvestre de Sousa, defied his elder brother Time Warp and two highly credentialled Japanese challengers to lead throughout in the Cup in a performance which fulfilled the promise he’s shown for some time. The Archipenko gelding held out late-closing Japanese filly Deirdre to win by a length with his brother and regular recent adversary Time Warp a short-head back in third place. “This is special. Yes today is amazing for me, I can’t believe it. For me, it’s my dream to get more good horses and win the big races and to win these two races today is amazing,” Lor said. Frankie Lor notches a memorable G1 double in the Hong Kong Sprint and Hong Kong Cup. After the much discussed lead-up race, the Jockey Club Cup when Glorious Forever and Time Warp attacked each other in front, Lor knew he’d have to adopt a different tactic. “I talked to Silvestre yesterday and said ‘if he jumped good try to take the lead and if Time Warp pushed too hard then he could take the sit behind him’. We drew one and Time Warp seven so that made a difference,” Lor said. Three-time British champion jockey de Sousa is no stranger to major race success but this was his first Group 1 in his temporary home and was achieved with clinical precision, aligned to Lor’s instructions. A slow first 800 metres in 50.56s was vital in securing the all-the-way win. “Everything was in my favour,” de Sousa said, “the draw was perfect for riding a horse who could be one or two in the run. Everything went to the plan. Silvestre de Sousa enjoys a wonderful week, first taking the LONGINES IJC and then his first G1 win in Hong Kong. It’s likely de Sousa meant the “Japanese” rather than the Europeans as the top two in the market were Sungrazer and Deirdre and the latter steamed home from the back but the early fractions said she faced a herculean task. “She travelled well behind Sungrazer in the run and picked up well and gave her all to the finish,” said jockey Christophe Lemaire. Glorious Forever makes a winning first G1 appearance in the Hong Kong Cup. Lor would not be drawn on immediate plans for Glorious Forever but certainly didn’t rule out an international mission. “I’ll need to talk to the owners first and I’ll need to have a good look at the overseas programmes so it’s a maybe,” Lor said.